What's the Difference Between Office Supplies and Office Expenses? Before we can discuss how to deduct office supplies and office expenses, we first need to look at these two terms to explain how they are different and where these categories are included on your business tax return. Included is information on new IRS procedures for expensing small cost office assets like software instead of having to depreciate these assets. We'll also look at where to put these two types of expenses on your business tax return. It does matter whether you put office costs under supplies or expenses. Most supplies are included in regular business expenses, while office expenses are listed separately. Some higher office expenses actually become business equipment, and these are categorized as assets and depreciated (taken as an expense over a period of time. Places to keep supplies, like fixing cabinets and storage lockers. The IRS also includes postage in office supplies, but large amounts of postage for shipping products are classified differently (see below). You could also include small items of furniture (under $2500) in this category, such as a used desk or bookcase. Some shipping supplies are not considered as part of office supplies. Any supplies and postage for shipping products you sell should be tracked as part of cost of goods sold. The calculation for cost of goods sold is separate from the list of business expenses. Office Expenses are the other expenses of running an office, including web site services, internet hosting fees, domain names, monthly costs for apps (like Dropbox). web based software like QuickBooks products, merchant account fees, and most software and hardware. You might also put cell phone expenses in office expenses (or in utilities). Some of these expenses may be listed property, and you will need to keep good records to separate out the business and personal use, for items like laptops and tablets. You may deduct the cost of office supplies and materials you have used during the year. You may also deduct the cost of stamps and postage charges and postage used in postage meters during the year. It used to be that all business assets (items used for more than a year) that cost more than $500 had to be depreciated over the life of the asset. Now, the IRS has a new simpler method for taking smaller cost assets as expenses instead of depreciating them. Effective in 2016 and beyond, you can deduct as an expense business assets (including office assets) that cost $2500 or less. This includes software and software suites, laptops, tablets, smartphones, and other smaller electronics. The cost you can expense includes the cost to buy and set up the item. Let's say you need Adobe Acrobat X Professional for your work. The cost of this item is typically over $500. Previous to the new IRS rule, you would have had to depreciate the cost. Now, because the maximum for expensing is $2500, you can take the item as a business expense in the year you buy it and start using it. If any office supplies, expenses, or equipment cost over $2500, these become depreciable assets, and you must depreciate these assets. You will need to talk to your tax preparer about the records you need to keep and get help with calculating the depreciation since each asset has a different useful life. 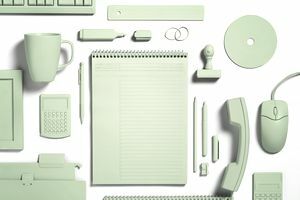 Be careful to distinguish between office supplies and equipment used generally in your business to operate your office vs. supplies and materials used to produce products. The supplies and materials you use to produce products are included in cost of goods sold. In the same way, you can't deduct postage and shipping for products sold; these are considered part of your cost of goods sold. If you are stocking up on office supplies and buying office equipment, computers, and software as part of your business startup, you will need to keep these costs separate. You may be required to spread out these startup costs over several years. Keep a list of the costs and discuss them with your tax preparer. For sole proprietors and single-member LLCs, show office supplies in the "office supplies" category of Schedule C, on Line 22. You can include office expenses (including those expensed under the new rule) in this category or you can separate office expenses out and include them with "Other Expenses" on Line 27a. For "Other Expenses," you must list the different categories on Part V of your Schedule C, bringing the total to Line 27a. For partnerships and multiple-member LLCs, show these expenses in the "Other Deductions" section of Form 1065 (line 20). You must attach a separate statement breaking down the different deductions included in this line item. For corporations, show these expenses in the "Other Deductions" section of Form 1120. First, you must include a statement listing the deductions, then include the total on "Other Deductions," Line 26. If you want to keep things simple on your tax return, put all office supplies and office expenses together as office supplies. Then separate out the more expensive items over $2500 and talk to your tax preparer about depreciating these items. Can You Deduct Political and Lobbying Expenses?